When it comes to finding a quality commercial truck that can pound over pavement without sacrificing an inch of safety or driving pleasure, there’s nothing that can quite compare to a Chevy Box Truck for sale from a Chevy dealer near you. Built to offer easy maneuverability, an easily accessible engine, and many upfitting options to make your Chevy work just the way you need it to, Chevy’s impressive Low Cab Forward options bring decades of automotive excellence together with the reliability of the Chevy nameplate to offer some of the best Box trucks for sale on the market today, and those who know trucks know nothing can quite compare to a quality Chevy. Whether you’re in the market for serious, uncompromising power or something built with efficiency and excellent handling in mind, each Chevy truck available offers something a little different. The trick is to figure out which Chevy truck works best for your needs, and that comes only from reliable research and an eye for what drivers need when they come looking for a dependable low cab forward commercial vehicle. Chevy’s got it all, and it’s worth taking a closer look to determine exactly what you may be looking for. Here’s a look at some of today’s most impressive Chevy Commercial Truck options, and some insight as to which is best to choose depending on your needs. Take a look and see for yourself just how much Chevy offers – and don’t be surprised if one catches your eye. Crafted to be the most basic options available without seeming bare or sparse on power or features, the Chevy LCF 3500 and 4500 each offer uncompromising power to match a handy design that’s perfect for small to mid-size hauling jobs. Packing a standard 6.0L V8 gasoline engine, these impressive and scrappy riders can pump out an incredible 297 horsepower and 372 lb.-ft. of torque to make even the toughest inclines no biggie behind this wheel. Available in Regular Cab and Crew Cab configurations, the Chevy LCF 3500 and 4500 offer impressive customizability so that you can make sure you’re getting the exact truck to match your needs. Built with a Gross Vehicle Weight Rating of 12,000 lbs and 14,500 lbs., respectively, these trucks pack some serious payload power – between 6,246-6,978 lbs. maximum for the 3500 and 8,442-9,174 lbs. maximum for the 4500. That means you won’t find yourself struggling to handle standard loads in these Chevys – just another example of how the bowtie brand continues to excel over the competition. Those looking at long hauls ahead and days spent driving without heavy loads in tow should consider the impressively efficient Chevy LCF 3500HD, a powerful and yet highly fuel-conscious commercial option sure to let you breeze past the gas pump while cruising over miles and miles of open road. Built to save on gas, the 3500HD boasts an impressive 3.0L I-4 4J turbocharged diesel engine mated to a 6-speed transmission with double overdrive. The power of diesel offers drivers almost unmatched efficiency for those long trips, all while packing enough power to pump out 150 horsepower and 282 lb.-ft. of torque. And since this commercial Chevy features a max payload range of 7,607 lbs., the 3500 is truly a commercial vehicle built with the driver’s comfort and convenience in mind. Part of what makes all Chevy commercial trucks so impressively versatile is the cab over design, which offers the driver optimal visibility on the road. This is especially useful in tight urban areas, where visibility can be tricky and hazards can be fast and sudden coming around tight corners. The cabin’s design also acts as a key feature for crews that make multiple pick-ups and deliveries throughout the day, and that’s all thanks to the cab over box’s ease of entry and exit. And with easy access to the engine compartment at your command, routine maintenance is more convenient than ever. But for those who prefer a more traditional design, the 3500HD also offers a Regular Cab configuration, meaning you can still get all this amazing and useful power in any style you find most comfortable. For those who simply can’t make a compromise between pure power and efficient operation, the elevated Chevy LCF 4500HD, 4500XD, 5500HD, and 5500XD each offer a unique twist on how to best combine both. Built to offer amazing levels of building power as you move up the trim levels, these upper-level Chevy commercial trucks are simply untouched when it comes to mixing style with substance. These impressive vehicles are all underpinned by the power of Chevy’s impressive 5.2L I-4 4H turbocharged diesel engine, capable of an amazing 215 horsepower and 452 lb.-ft. of torque, running on clean diesel fuel power. That allows the 4500HD, 4500XD, 5500HD, and 5500XD to boast impressive maximum payload ranges of 7,776-8,536 lbs. (4500HD), 8,840-9,607 lbs. (4500XD), 10,680-11,461 lbs. (5500HD), and 12,294-12,875lbs. (5500XD). These high-powered movers also come with plenty of room for customizability, with the 4500HD, 4500XD, and 5500HD all offered in available Regular Cab and Crew Cab confiruations, and the 5500XD offered in a Regular Cab configuration. That way, you can find exactly the Chevy commercial truck that’s right for you, no exceptions. And don’t think all this power means there’s nothing to make the drive enjoyable. These trucks feature interiors which maximize the use of space to benefit drivers, including amazing features like fold-down trays that can function as a laptop work area, and convenient storage areas in the dash, doors, seatback pockets, overhead shelf, and rear organizer tray. With all this, you’ll feel at home in the cab of your Chevy truck no matter how far you may have to go ahead. 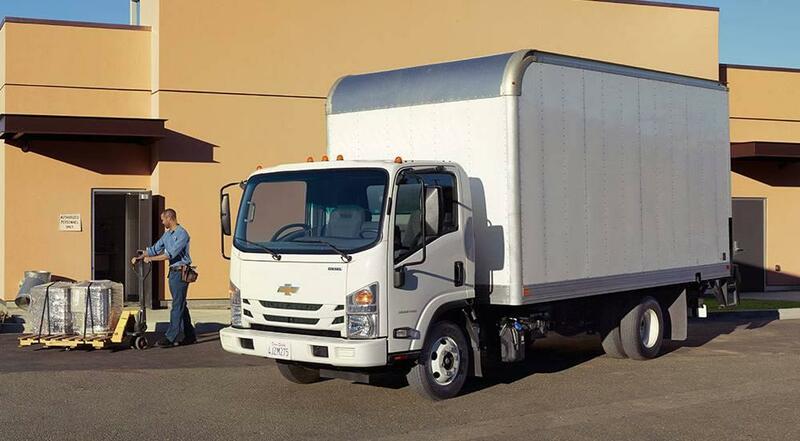 Whatever you may be looking for, Chevy has a Box truck that will fit your needs. Check one out for yourself today, and consider getting a Chevy commercial truck for your crew – it may just be the best decision you or your business has made in a long time.